Боковая регулировка параллакса помогает повысить точность стрельбы на разных расстояниях. All Monarchs can be customized with accessory target-style windage and elevation adjustment knobs and caps. See accessories.Africa has long been a continent of dreams and for hunters around the world. For those seeking their dangerous game adventure on the Dark Continent, Nikon has a new riflescope series that is more than ready for the hunt. 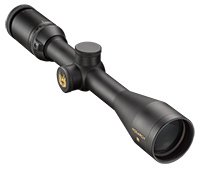 With ultra wide field of view, four time magnification zoom and generous eye relief, the MONARCH African gives you everything you need in a dangerous game riflescope.